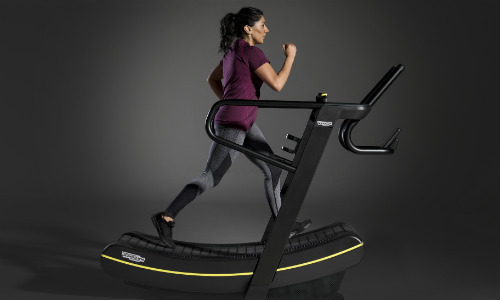 The TECHNOGYM SKILLMILL might seem daunting, but because of its unique design it offers advanced training capabilities that other curved treadmills don’t. Watch the film or browse the benefits below. It's non-motorised, so it gets you to do all of the work to build momentum, working you harder in the process. It also makes it really simple to use: just hop on and start moving. Its multidrive technology gear system allows you to set the level of resistance for either speed or stamina training using a push-pull lever (making it as easy as pie). Its straight and curved powerhandles allow you to position yourself ideally for different power-based push exercises. Using the powerhandles you can replicate sledge pushes, straight-arm pushes, bent-arm pushes and high-resistance side pushes, all the while using your own velocity to power the belt. You can use the SKILLMILL to improve your coordination and motor skills by practicing grapevines, two-in-ones and two-in-twos using the side handles to steady yourself. Great for anybody training for agility sports like football, rugby or hockey. Unlike a regular treadmill, the SKILLMILL allows users to accelerate quickly from a walking pace, to a jogging pace, to a full sprint without making any adjustments. So you can work on your speed dynamically. It’s a handy skill to practice if you have to switch pace quickly in sport. Exercising continuously for long periods of time builds stamina. So you can combine increasing walking distances with speed training on the SKILLMILL to improve your aerobic and anaerobic fitness. 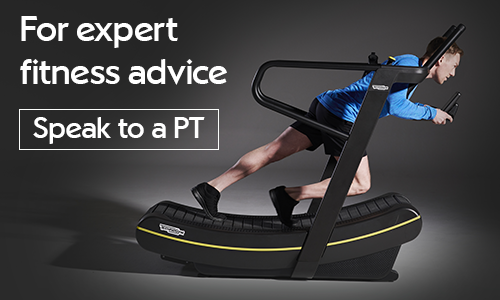 If you want to know how to get the most out of any machine in our gyms or how to improve your fitness in the long term come and speak to a Personal Trainer.